As a major supplier in fluid power, process, and several other sectors, Hallite Seals prides itself on reputation for providing a flexible and responsive service to meet the ever increasing dynamics of industry. In addition to our extensive range of stocked moulded products we offer custom designed sealing solutions incorporating extensive engineering support, CAD/CAM software, and an experienced team of technicians. 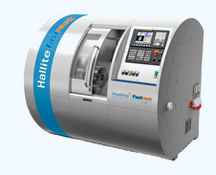 Hallite has the ability to produce an infinite number of profiles by using our computer aided software, customer prints and engineered sealing solutions. Our sealing products that comprise a complete high performance system solution can be manufactured from 0.250 of an inch (6.35mm) over 52 inches (1320mm) out of a wide range of application specific speciality elastomers and high performance plastics. Submit your seal specifications and requirements online today, for a custom seal quotation.